It's easy! With a sharp pair of pointed scissors, I can cut the slits and be done in less than five minutes! On the pistol holster side see the picture for where the three slits are cut. The top slit must be no longer than two inches and should be along the top seam towards the front of the pocket as shown. 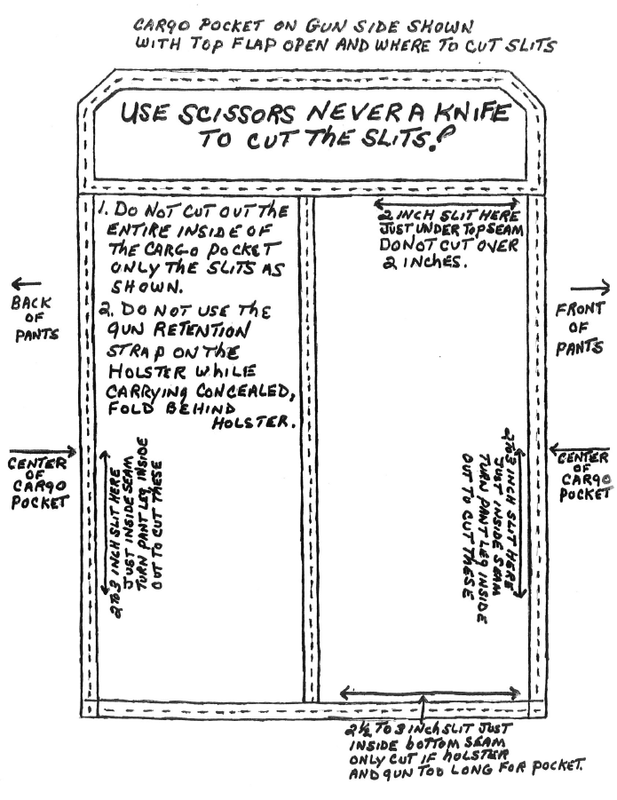 The two side slits should be cut as shown on both side seams in the middle downward for two to four inches. Turn the pant legs inside out before doing this. 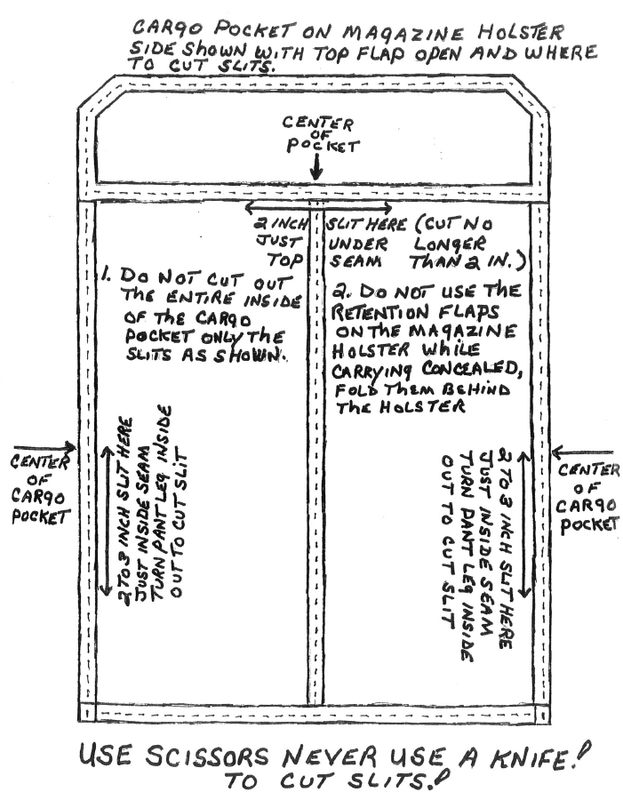 The bottom slit as shown is only cut if gun & holster are too long for pocket. Use scissors do not use a knife. Click on picture to enlarge. On the magazine holster side see the picture for exactly where the three slits should be cut. The top slit should be cut exactly in the middle as shown and no longer than two inches. 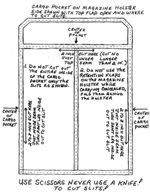 The two side slits should be cut as shown on both side seams in the middle downward for two to four inches. Turn the pant legs inside out before doing this. 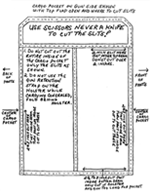 Use scissors do not use a knife. It's easy to use! With cargo pocket pants & shorts, I can install the system and be carrying concealed in less than five minutes! Click on picture to enlarge. 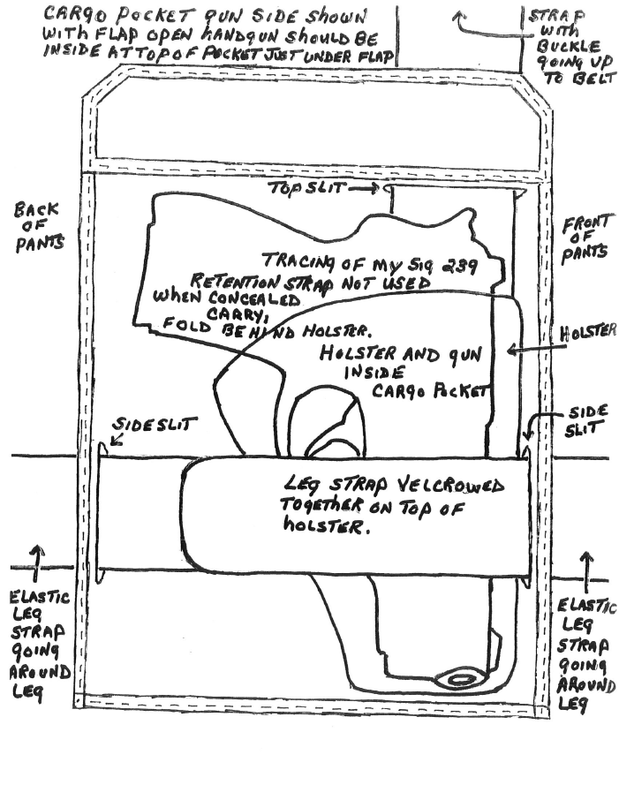 Put the holsters in both pockets, run the leg straps through the side slits & attach back to the holsters. Run the belt straps through the upper slits and attach to the cam lock buckles. Put our tactical belt or your belt through the loops above the cam lock buckles. Sit down and put on pants slipping your legs through the leg straps and fasten the belt and your pants. Put your gun and magazines or second gun in the holsters close the pocket flaps and you are good to go! 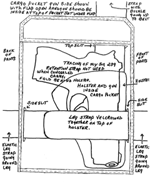 See diagram of pistol in cargo pocket. Click on picture to enlarge. Helpful tips, do not use retention straps on gun & magazine holsters while carrying concealed, gun and magazines are safely enclosed by holsters and pockets, just fold retention straps behind the holsters. When used as a regular tactical carry system on the outside of your clothing, always use the retention straps! For ladies carrying concealed under a dress or a skirt always use the retention straps. Never cut out the entire inside of the cargo pocket, it can then snag on the gun and the gun is not secure in the pocket! Remember when using the retention straps, fasten the leg strap BEFORE you fasten the retention straps. Drawing quickly and forcefully pops off the retention strap, you can put the retention strap over the handle or over the frame or between the frame and the hammer but not over the hammer spur because it will snag. To be fast, draw the handgun with speed and force which pops off the retention strap, for a stealth draw lift the retention strap with your hand on the handgun and then draw the handgun when ready to. Remember carrying a handgun concealed is a Very Heavy Responsibility, NEVER EVER DRAW YOUR HANDGUN UNLESS YOU ARE DEFENDING YOUR LIFE OR SOMEONE ELSE'S LIFE. If Everyone in the World carried a Handgun, but ONLY used it for SELF DEFENSE, there would be no Deaths by Handguns in the World Today! I have the highest respect for our Military and Law Enforcement Personnel, but they can't be everywhere, and I believe every LAW ABIDING CITIZEN in this country should have the right to carry a handgun concealed. I have carried handguns concealed for over 30 years now since Viet Nam and only had to draw my handgun once(no shots fired, Thank God! ), however who knows what tomorrow might bring, carrying a handgun concealed is like carrying insurance, you hope you never have to use it, but it is there if you need it. If you have not already, I recommend that you check with the State and County that you live in (Sheriff's Office or Police Department) and apply for a Concealed Weapons Permit. In Iowa, some counties require a class which is excellent on safety, the law, shooting, and how to carry concealed, and you have to pass a background check. I took the class with Training Specialists which is endorsed with most counties in Iowa and covers Utah, Florida, and Minnesota non resident permits, with Instructors Des Moines Police Officer Steve Anderson and his wife Renee, they are excellent instructors and offer the classes for The Iowa Permit to Carry and Advanced Self Protection Training. No matter what state you live in you can take the class through Training Specialists apply for a $59 Non-Resident Utah permit and carry concealed legally in about 30 states. Including Iowa, there are a total of 24 States that I can legally carry concealed in, all for a $75 dollar class and $11 License or Permit to Carry. A non-resident can also apply, which I intend to do, for a Florida permit ($117) or a Utah permit ($59) which permits you to carry concealed in about 30 States. I recommend you go to www.handgunlaw.us for the very latest in all 50 States and their laws on concealed carry, and links to each individual State's Laws on Concealed Carry. Lastly, I want to Thank You! For visiting my website and hopefully buying my CONCEALED CARRY CARGO POCKET PISTOL HOLSTERS SYSTEM, there are many fine pistol holsters out there on the web and I encourage you to visit them all, you can't have too many handguns or holsters! AGAIN, NEVER PRACTICE YOUR DRAW WITH A LOADED HANDGUN, ALWAYS CHECK AND USE AN UNLOADED HANDGUN, AND NEVER EVER PUT YOUR FINGER ON THE TRIGGER OF YOUR HANDGUN UNTIL IT HAS CLEARED THE HOLSTER AND IS POINTED SAFELY AWAY FROM YOUR BODY DOWNRANGE AT THE TARGET YOU HAVE IDENTIFIED. WE ASSUME NO LIABILITY FOR ANYONE WHO DOES NOT PRACTICE THIS!